This article describes the step to install TM1py on a server with no internet connection. Once downloaded copy the installer into your server and follow the installer steps. In this article we chose to install Anaconda. It will return the path where Python is installed. Then you paste the TM1py folder into C:\ProgramData\Anaconda3\Lib\site-packages (or wherever the install-directory of python / Anaconda is located on that machine). Then in the TM1py directory inside the lib\site-packages folder it should look exactly as in the lib\site-packages\TM1py folder on your local machine, where you installed TM1py through pip. If you are new to TM1py, this article will guide you to setup TM1py and all the different modules required in the Cubike example. TM1py uses the TM1 REST API to connect to the TM1 instance. In this example, our tm1srv01 instance uses the port 17001 for the REST API. To find out which port your TM1 instance is using, open the tm1s.cfg file and check the HttpPortNumber value. Data Integration with TM1py.ipynb: Jupyter Notebook to load data into TM1 from a web service. Data Science with TM1py.ipynb: Jupyter Notebook to analyse the data. nyc.csv: Bike Sharing data from New Yord City. public holidays.csv: Public Holidays data. washington_dc.csv: Bike Sharing data from Washington DC. setup.py: Python script to create TM1 objects. For demonstration and documentation purposes all the python code in this series is distributed through Jupyter Notebooks. Jupyter Notebooks allow you to create and share documents that contain live code, equations, visualizations and narrative text. A quick introduciton to Jupyter can be found here. This example contains two Jupyter notebook (.ipynb). To open these two notebook, we have to install Jupyter first. 2) C++ Compiler is required by Facebook Prophet, you can download it from Build Tools for Visual Studio 2017 and run as administrator .exe file. A restart of the server will be required. 5) Facebook Prophet is a forecasting tool. + What is TM1py ? TM1py is a Python package that wraps the TM1 REST API in a simple to use library. That makes it easy to build stuff with TM1 and python. + What is Python ? Python is a widely-used general-purpose programming language that lets you work quickly and integrate systems more effectively. + Why you should use TM1py ? Load data (e.g. FX, stock data) from web services into TM1 such as Quandl financial. TM1 server should be on version 10.2.2 FP5 as minimum. + Do I need a license to use TM1py ? TM1py is a free and open source (MIT license) and there are no limitations of any kind. All of the code, documents and information in TM1py are to be deemed without warranty. + What TM1 security does TM1py support ? TM1py supports TM1 Security mode 1, 2, 4 and 5. TM1py supports CAM authentication which allows any LDAP directory to be used including the Active Directory. The source code is hosted at github.com/cubewise-code/tm1py. If you find a bug or feel like you can contribute please fork the repository, update the code and then create a pull request so we can merge in the changes. + How do I get started ? Just follow this Quick startup guide and you will be able to run your first Python script in less than 5 min. Jupyter is an open-source web application that enables you to mix code-execution and comments. It is great to tell a story and run through the code sections by sections. The main difference with pycharm is that jupyter allows you to execute your python scripts sections by sections. Jupyter notebook is a web app, that allows us to write code in a more narrative, interactive way. You can share notebooks through mails or host them at a shared platform. Jupyter Notebooks are a great, new way to tell a story with your TM1 Data. Hold shift and right-click in the folder. Then select "Open command window here". This should open the command-line (or PowerShell depending on your Windows version). Now type "python check.py" into the console to execute the check.py script. TM1py will then try to connect to your TM1 instance. It will print out the name of the TM1 instance. If this works without Errors you should be able run any of the samples. All the samples are based on the Planning Sample TM1 model, that comes with the installation of TM1. The samples potentially contain hard coded references to TM1 objects (e.g. cube names). Make sure to adjust those references if you are not testing against the Planning Sample! To use TM1py samples, you do not have to have a development environment, you can just edit the script in a text editor or in jupyter and then run the script. But if you want to dig deeper into the Python language, having a development environment will make your life easier. Why do you need a development environment? If you want to explore the TM1py code. See the TM1py scripts in multiple windows. Edit and run your scripts in the same interface. This article explains the steps to run a TM1py script from TM1 process. In this example python.exe is located in C:\Python36\python.exe. CommandLine will be the path of the python.exe and the script. Set Wait to 1 if you want the TM1 process to wait for the script to finish Wait to 0, if you want the process to go straight to the next line. Because there are spaces in the script name, we need to add double quotes "" inside the single quotes. Save the process and run it. 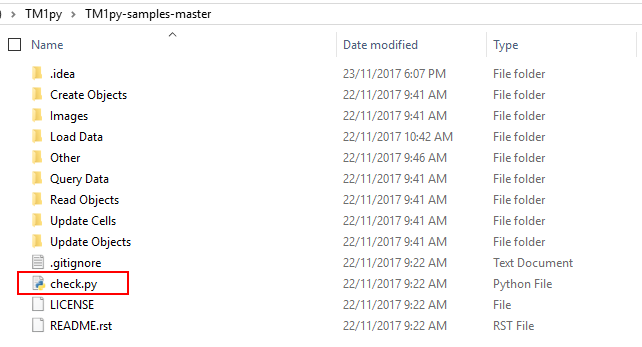 "C:\Python36\python.exe" "C:\TM1py\TM1py-samples-master\Load Data\fx rates to cube daily.py"
If you are planning to run multiple scripts, it is a good practice to store the file locations in a TM1 cube, so you can easily update the file locations if you need to. You can access the code of the script used in this example, fx rates to cube daily.py on Github. All the TM1py scripts in the Load Data folder requires some TM1 objects. These scripts load data from different datasources into TM1 cubes. If you want to test these scripts without changing the target cubes, you will need to create these TM1 objects. If the command line shows errors it could be either because you are not running the script in the right folder or tm1py can't connect to the TM1 instance. Check if the connection with TM1 works. TM1py uses the TM1 REST API to connect to TM1. Follow these steps to enable the TM1 REST API.